Originally built for Henry Knickerbocker by D. & J. Jardine c. 1873 at Fifth Avenue and East 64th Street in New York City, the residence was entirely remodeled by Brite & Bacon for George and Emma Crocker c. 1899. Crocker was vice-president of the Southern Pacific Railroad Company and president of the Oriental and Occidental Steamship Company among others as well as special partner in the brokerage firm of Price, McCormick & Co. The residence was demolished c. 1930 and replaced with 834 Fifth Avenue, a Rosario Candela designed apartment house. A grand city residence and George also had an equally grand country estate Darlington, in New Jersey which was wonderfully restored a few years back. Contains some truly impressive wood carvings and interiors. Kudos to the company that undertook the restoration work. This 1898 article says the Knickerbocker house was torn down and replaced -- not remodeled. It also quotes the architect as estimating construction costs of $100,000. It wouldn't be the only house on Fifth where someone somewhere made a comparable mistake. What STYLE could it properly be called ~ 'Parisian Boulevard' ?!! None of the mansions lining 5th ave on this block exist. 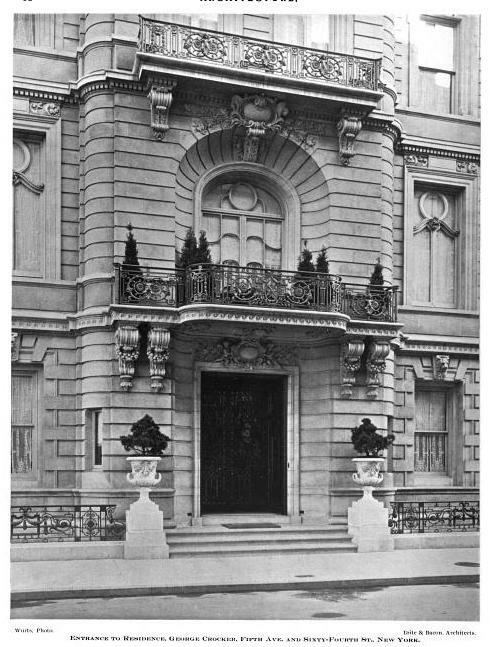 The Warren & Wetmore book referred to the mansion as the residence of James Ben Ali-Haggin. When 834's skeleton was up, according to Alpern's Candela & Carpenter book, the widow of Mr. Haggin sold her mansion to the developers and lived in a duplex on the 64th st side for an additional 35 years after her 95 yr old husband died, how old was she? 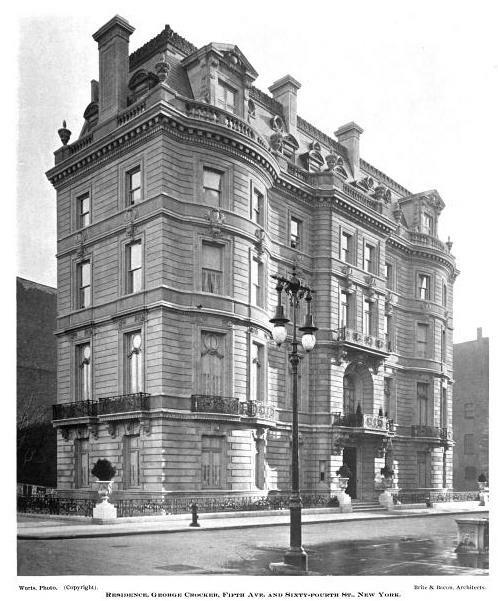 So the extant Edward Berwind residence sits on the southeast corner of 64th Street directly opposite the Crocker mansion? Its somewhat miraculous to have the Crockers enormous New Jersey mansion revert back to private ownership. And what an effective use of those urns. In this case, I would guess they were white marble. Neat to see this---I've wondered about Mr. Crocker's domestic arrangements in town. It's handsome, and very lush isn't it. Lucky Mr. Crocker---in a short drive he could move he could go from the Belle Epoque to 16th century England. Clearly a man of some taste---to compare the Darlington house interiors to those of the Pratts at the Braes is night and day.